What it takes to build a meditation practice. Have you noticed that your mind will fill up every single moment with thoughts if you allow it? Meditation can really help you create space that won’t crowded out by the minute-by-minute chatter that we are subject to most of our waking lives. As you build out your practice, you’ll find that your sense of time tends to shift when you’re in meditation, but there can be amazing effects that spillover into your waking life - a feeling of spaciousness that wasn’t there before. Here’s the but: these benefits may not accrue overnight! Meditation involves building a muscle, and it takes some time to settle into a routine that works for you. It can also take some time to see the real results! The thing is, if your routine doesn’t work for you, you won’t do it. I read an amazing book called the Power of Habit a few years ago. It talks about how to build and break down new habits. The basic anatomy of any habit is cue, habit, reward. Here’s how to apply this structure to building a meditation practice. Before you begin...I suggest creating an altar - this can include some representations of the elements: earth, air, water, and fire. Place items on the altar that are beautiful and that inspire you. There may be representative images you want to include. A vase full of flowers is always a nice touch, too! Step 1: Your CUE: Light a candle and potentially some incense to set the mood. Play your favorite music. (I recommend creating a meditation playlist or asking a few friends if they have any light instrumental music they really like). Step 2: Start forming the HABIT: start small, and set reasonable goals for your meditation practice. There are two basic forms of meditation: active and passive. Passive meditation is more about focusing on your breath, and being aware and present with a quiet mind. This type of meditation is more about resetting, accessing an inner peace, and cultivating a sense of oneness. Once you can hold a passive state for 5-10 minutes, I recommend trying an active form. Active meditation is more about using symbols, words, images, or concepts that have the ability to penetrate more deeply into your psyche. It is, however, important to choose widely and work with beneficial and universal symbols. One example of a universal symbol is the circle; you can immerse yourself into this symbol and allow it to come alive inside you. Use your five senses to engage with the circle; what does it feel like inside it? Step 3: REWARD yourself. At the end of the month, reward yourself with something that you’ve been wanting. Maybe you’ve been wanting to get some body work done, or try a new restaurant. Set aside a budget at the beginning and if you reach your goal, make sure to do it - this helps us build trust with ourselves that we will be rewarded with good behavior. Finding someone to hold you accountable is a great way to build out a positive habit as well; consider sharing your goals with a friend, or tracking them in a simple excel sheet and sharing it with someone in your network. 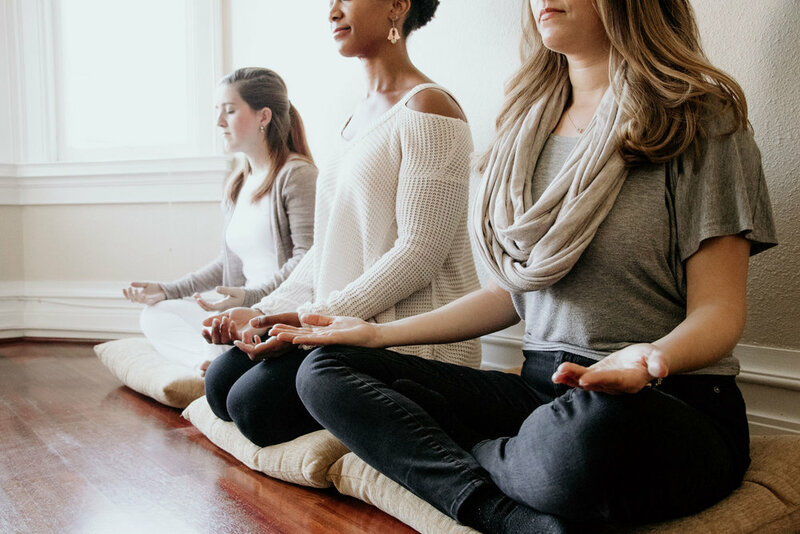 And, at the end of the day, group meditation is a great way to build your muscle, and build community. Consider attending a 4-week series I’m running starting February 20th; bring a friend and receive a discount. You can read more information & registration here.